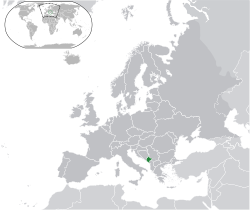 Constitution names Cetinje as the Old Royal Capital (prijestonica) of Montenegro. ↑ "Language and alphabet Article 13". Constitution of Montenegro. WIPO. 19 अक्टूबर 2007. Serbian, Bosniac, Albanian and Croatian shall also be in the official use. ↑ "Census of Population, Households and Dwellings in Montenegro 2011" (PDF). Monstat. पहुँचतिथी 12 July 2011. ↑ 3.0 3.1 3.2 3.3 "Montenegro". International Monetary Fund. पहुँचतिथी 17 अप्रैल 2013.